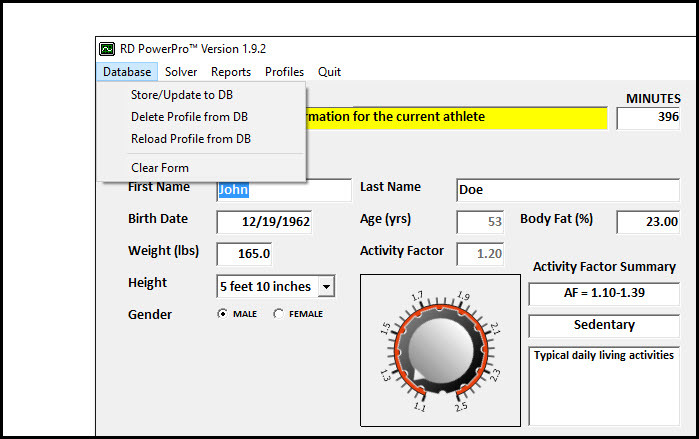 The RD PowerPro™ Standalone Software License includes the ability to store your User Profiles on our MySQL Server that is connected directly to the Internet. As a result, you can access your data anywhere in the world on any computer (with the software installed) as long as you have Internet Access (Port 3306 must be open on your Firewall and Gateway). We also make sure that your data is backed up and secure. The RD PowerPro™ Network License version allows a group of Registered Dietitians to share their stored User Profiles that are part of the same Company, Clinic, and/or School. Not sure which license to purchase? Our Software Installation includes both the Standalone and Network Licenses. We also offer the capability to easily upgrade at the cost differential from the Standalone to the Network Software License. Use our proprietary SOLVER algorithm to optimize diets in terms of calories, number of servings per food item, and goals in terms of Carbs, Protein, and Fat. Copyright © 2019 RD PowerPro™. Powered by WordPress & Corpo Theme.